The annual SnowGlobe Music Festival is a time for trancing music, fun experiences, and exquisite art. This year the festival featured the ZOA sculpture, a playful expression of art made by the Chromaforms Art Collective. The Chromaforms Art Collective specializes in making playful and interactive art creations with the help of engineers and sculptors. “A lot of our projects are community based, or we try to get a lot of people to help and to make something,” said Martin Taylor, an engineer who helped start Chromaforms. Taylor originally worked as an engineer in a prototype technology lab. After he was done working for the day, he would use the big 3D printers to create little sculptures at night. This is what drove his inspiration to start Chromaforms and to eventually quit his day job and pursue art and creation full time. 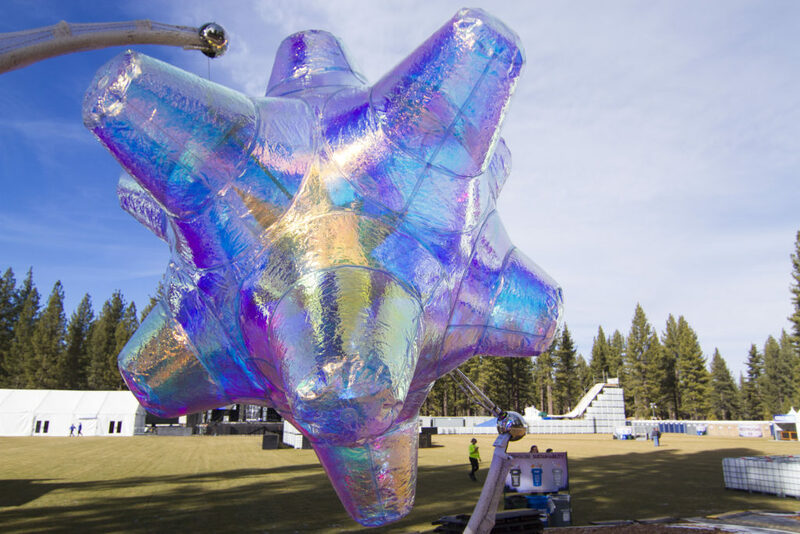 Taylor said the goal of the ZOA sculpture is, “To bring out a very playful aspect in people that often gets lost in larger society.” The piece was originally supposed to be a jellyfish that was going to debut at Burning Man. However, Taylor discovered that another artist had that same idea, so he had to change paths. By having the same jellyfish idea in mind, he used rainbow colors and soft and wrinkled materials that can change and be less predictable. There is also a mini faux fur star inside of the creation that adds a hidden magical element to the ZOA. He wanted the piece to stand out and for participants to “be invited to investigate.” The ZOA piece is one of the first things you see when you walk in and adds an essence to the overall feeling you get from being at the festival. As the night got darker, more people seemed drawn in to the ZOA. Fans would touch, spin, and often sit under it. “It brings people to a childlike state,” said Taylor, “It’s like a game.” Taylor described the piece as almost like a hologram at night. No matter which stage you are at, the ZOA seems to be the central location of the festival grounds. “There is also the element from seeing it from far away and investigating it.” said Taylor. 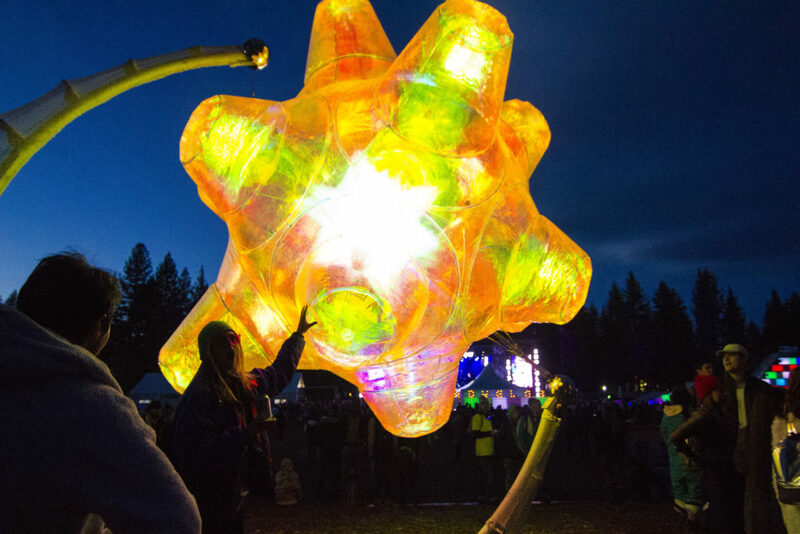 The ZOA sculpture made its first major appearance at Burning Man this year and later to EDC Orlando. The Sculpture folds down easily and deflates, so it can depart from one event to the next. “It’s going to be there for a little while, and then it’s going to travel somewhere else.” said Taylor. The overall essence of the ZOA adds a deeper meaning to the culture of what is SnowGlobe Music Festival. The next project Taylor plans to work on will try to star plastic bottles and ideas to bring new energy to things people see as everyday wasteful items. Taylor’s advice to potential artists is to try to have a day job and pursue art at the same time. “Doing art is just equal as much work,” said Taylor.